Stratford Caldecott was a man fitted for our time. We must submit to providence about why he has left us so soon. We come to mourn his passing, but also to recall his life. What did he have to say to us? There are likely few here today who have not been surprised, even initially unsettled, by some reflection of Strat. Why is he interested in this? Or in taking that particular aspect of experience or cultural-religious argument so seriously? It doesn’t fall into customary categories–certainly social-political categories, but sometimes even the categories to which we are most accustomed as members of the Church in our relations with the world. His gift to us, however, lies just here, in his constantly calling us to look more deeply and more comprehensively at the meaning of things, of life and the state of culture. His gift to us, in other words, lies in his catholicity–an often misunderstood but nevertheless essential term. Whatever you do, do everything for the glory of God. Avoid giving offense, whether to the Jews or Greeks or Church of God, just as I try to please every one in every way, not seeking my own benefit but that of the many, that they may be saved (σώζω: save from death, keep alive, preserve) (1Cor 10:31-11:1). It is the indissolubility of the “everything” and the “giving glory to God” expressed in this text that is just the point for Strat. It is the penetration into the center, the heart of the divine logos incarnate in Jesus Christ, that both impelled his dialogue with what may have appeared to us at times peripheral, and enabled his generous embrace of things–of all things and of each thing in its integrity. “In the beautiful logos,” writes Strat, “all things cohere. In the Word of words, all threads of meaning are drawn together, and the notes and noises of our lives add up to parts of a symphony” (The Radiance of Being, 5). Here, then, is the center from which Strat never strayed. Here, in the trinitarian God, we find the original generosity–the giving and gift and gratitude–the traces of which he found hidden everywhere, a generosity that he saw struggling to come to expression in every human endeavor, even when otherwise broken. It is his recognition of this generous unity that prompted him to attend to things so various: to ponder the non-mechanistic natural order as indicated in quantum physics; to work toward an integrated social-economic order; to dialogue with other religions, uncovering their deep dimensions of the transcendent and the mystical; to recuperate the symbolic character of nature and language; to defend the integrity of the Church’s sacramental liturgical tradition, in its implications also for a cosmic liturgy; to affirm a theological order in the human body–the order of generous love expressed in the distinction between a man and a woman that is ever fruitful. The depth in this breadth of Strat’s sensibilities and abilities can be missed only if we fail to see the center that brings unity to it all. He engaged it all with a childlike innocence and humility, as well as with a courage that was as fearless as it was gentle and patient–and always ready of wit. This catholic spirit took in Strat the concrete form of community, above all in two senses. First of all, with Benedict XVI, he believed that an authentic human culture is possible only on the basis of our willingness to search for God and our readiness to listen to him. Strat’s inquiries grew out of a life of prayer and worship. His inquiries were also tied to, and grew organically out of, his lifetime of fidelity to his wife, Leonie, a fidelity that has borne abundant fruit in their dear children, Tessa, Sophie, and Rosie–and now also grand-daughter Evangeline. Leonie was Strat’s best friend, and his closest collaborator in all of his work. Her distinct voice is ever present in the symphony he and she together orchestrated to the world. What Strat has to teach us, then, is simple and radical (i.e., going to the roots): not a new program but a way of life. After the manner of St. Francis–and of St. Ignatius, whose feast the Church celebrates today, and who was one of the original and most important missionaries to modern culture in its global reality–Strat instructs us in the meaning of Catholic wholeness, now in the face of the fragmentations and reductions of modern intellectual and academic life, and of the social-political ideologies of the Right and the Left. He stands as a contrasting witness to the abstract catholicity of our electronic age, which in a technical sense can reach everywhere, but at the expense of never being anywhere, or truly indwelling any reality, in particular. Strat witnesses instead to the concrete catholicity rooted in community–with the God in whom we live and move and have our being, and as expressed in the marital state the measure of which is the free-intelligent act that says forever. And so, we come to mourn your passing from us, Strat, and to thank you–and Almighty God–for your life. We salute you and we bid you farewell, dear friend. May you rest eternally in the peaceful joy of the trinitarian God, in the company of Mary and all the saints, surrounded by the beauty of all of God’s creation. David L. Schindler is the Provost and Edouard Cardinal Gagnon Professor of Fundamental Theology at the Pontifical John Paul II Institute for Studies on Marriage and Family. He is also the Editor of the North American edition of Communio: International Catholic Review and the author of numerous books and articles. 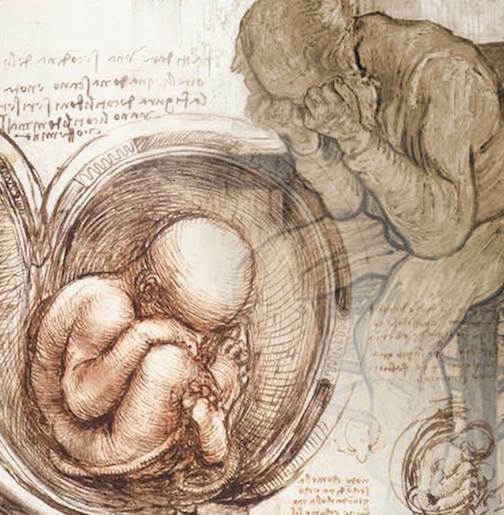 Leonardo da Vinci, Studies of Embryos (detail from notebook) and Vincent Van Gogh, Old Man in Sorrow (On the Threshold of Eternity). Image Design by Paige Sanchez.